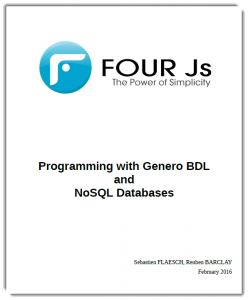 Genero applications traditionally connect to relational databases through its embedded SQL grammar. As a growing number of customers deploy NoSQL databases for business intelligence and analytics needs, so the need to connect to them grows. This white paper describes how to connect to JSON document-oriented NoSQL databases such as MongoDB and CouchDB.